With stomach bugs and flu running rampant just a few days before Christmas, many of us D Rents are living in fear that our kids will get sick and we will end up spending the holidays in the hospital. That would really bring out my inner Grinch! But you know what would be worse? Being diagnosed over the holidays. That was something that I was thinking about last year at this time when I had the idea to make care packages for our local hospital. I just couldn't stop thinking about how overwhelming that would be. I mean, it's overwhelming and terrifying any time of year. 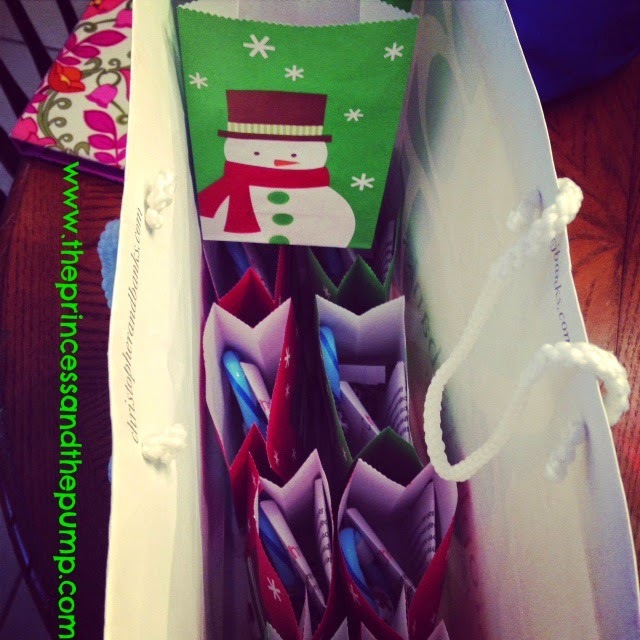 Add being inpatient during the holidays... too much. I wanted to do SOMETHING to make it a little bit better. So we put together a little bag of goodies and a note of encouragement that will hopefully bring a smile during a very difficult time. We enjoyed doing that so much last year that we decided to do it again! This year we put in notes of encouragement from Sweets and myself. 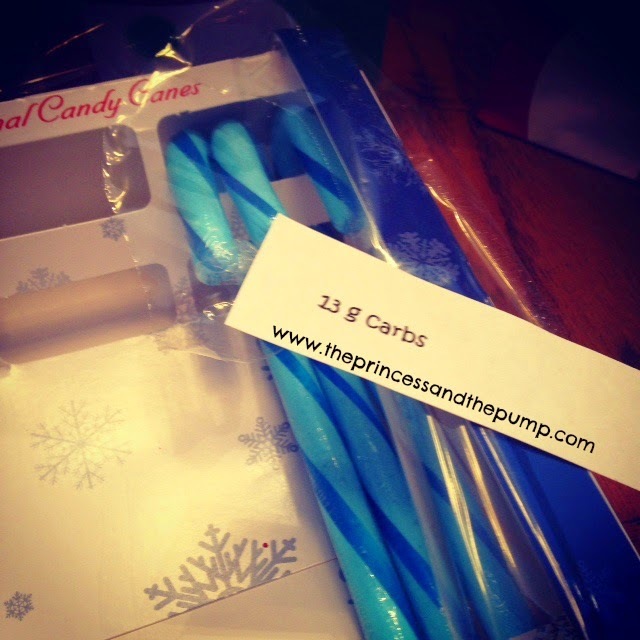 We added a JDRF bracelet and candy cane (blue, of course) with carb count attached! What are Ornapods, you ask? Ornapods are ornaments made out of Sweet's insulin pump, the Omnipod. Want to make some yourself? It's super easy... here's how! 1. Pull the adhesive backing off of the used pod. 2. Remove the unused insulin from the pod. You can use the syringe that you use to fill the pods or you can use just a regular syringe. Insert the syringe into the same place that you use to fill the pod. You can tilt it downward to get the maximum amount of insulin out. 3. Clean the pods with an alcohol wipe. 4. Paint the pods. I chose the cheapest paint I could find! You might want to look for one with a matte finish or one with shine. That's up to you! 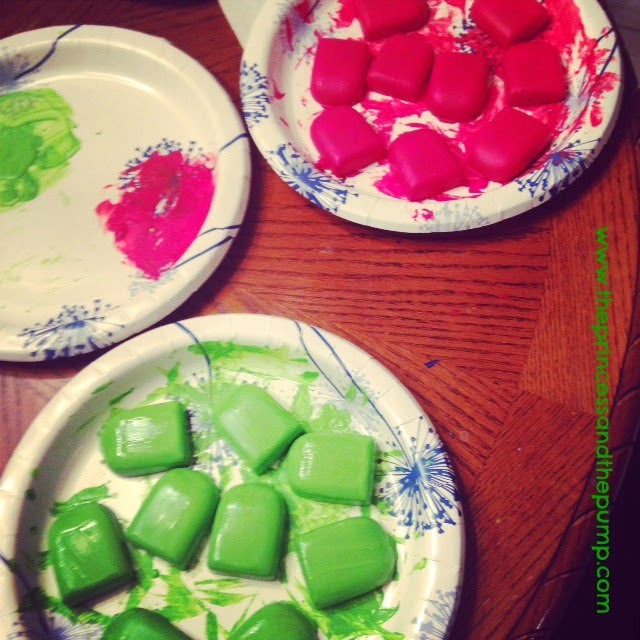 It may take a few coats of paint to get them to the desired color. 5. Seal the paint with Mod Podge. I picked out a sparkle kind this time. Who doesn't love glitter?!? This is optional. I just like the shiny look! 6. 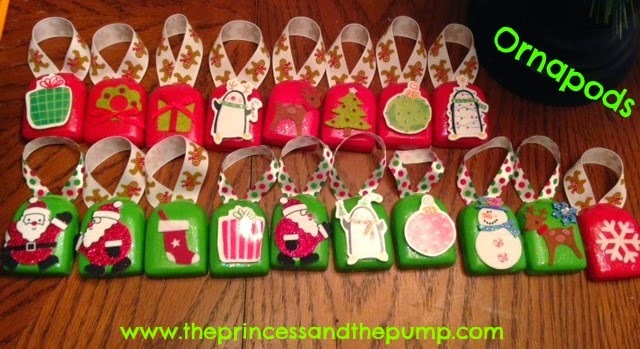 Use stickers to decorate the ornaments. 7. Use ribbon as a ornament hanger. Cut to the desired length and hot glue onto the back of the pod. 8. We used a silver paint pen to write the date on the back. Sweets really enjoyed making these! She was able to help and do a lot of the work herself - although the painting can get a little messy! She enjoyed picking out the stickers and the paint colors and the ribbon! 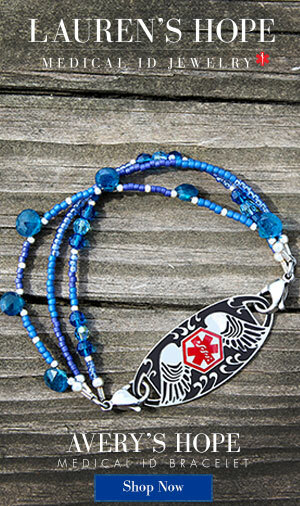 We use these as gifts for teachers, family members.... and our school nurse! Sweets even said, "It's kinda funny this was on my tush and now it's on our tree!" It's what kept my child alive for three days. It's what gave her the life sustaining medicine she needs. That makes it a pretty powerful statement of HOPE and COURAGE and STRENGTH. Or a better way to show a newly diagnosed family that although living with T1 is a difficult, strange, new world... it's not all bad. 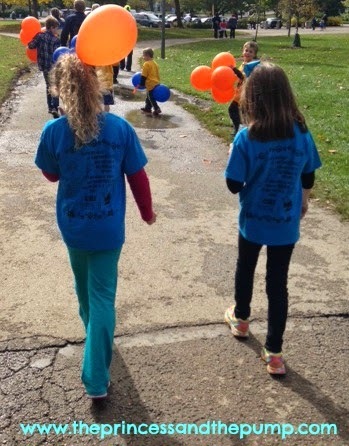 As you know, in October we participated in our sixth JDRF Walk to Cure diabetes. It's hard to believe we've done this six times! We know that you may be really tired of getting a letter from us each year! Please know that we are honored by your generous donations. 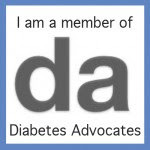 We know that there are numerous organizations where you could donate your money and we are honored that you chose JDRF. 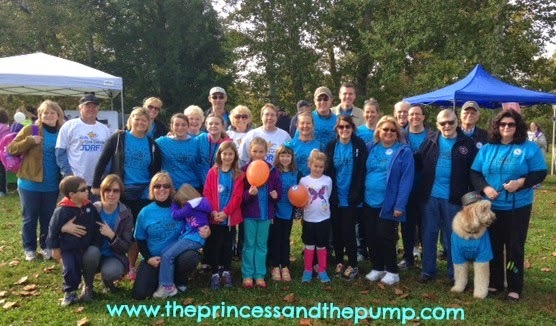 It's hard for us to ask year after year for you to support JDRF and our families efforts. But as much as we hate asking for money, what we hate more is watching our daughter fight this disease 24 hours a day for over half of her life. It's hard to watch her battle this disease day in and day out and know that there is nothing we can do to take it away. So we do whatever we can to work towards a cure. 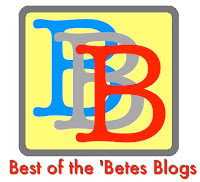 The best way we know how is by raising money for JDRF. This year our team raised a record breaking amount of money! With your help, we raised over $21, 700! This is the most we have ever raised... And to do that in year six when we know that each year raising funds gets harder and harder... It's incredible. In our six short years, we have raised over $90,000 for JDRF. How can we even begin to tell you how much this means to us? To tell you how much this means to Sweets and her future? Walk day to Sweets is almost like a birthday without presents. She looks forward to this day all year long. She loves helping design the t-shirts. She loves thinking up a new team name when the old one seems too babyish. 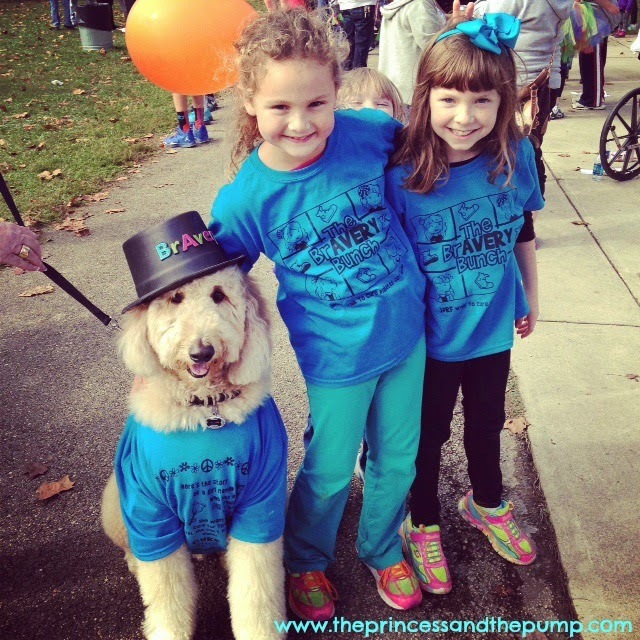 She loves seeing her friends and family show up wearing her shirt to support her on walk day. Did you know she eagerly looks forward to seeing each person there? You may not think she notices.. but she does. Her eyes light up with excitement each time she sees a new face arrive to walk with us. Your support means so much. 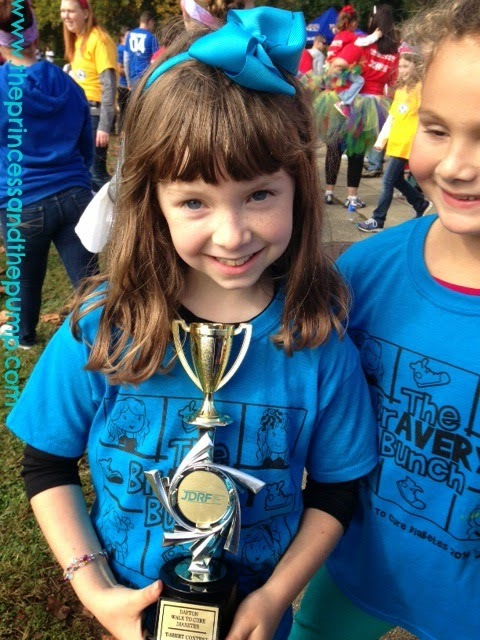 This year she was thrilled to be able to walk with her friends and enjoy a beautiful fall day. She was SO EXCITED to find out she won the t-shirt contest! She loved dancing and being silly celebrating... even with our canine team members! Walk day isn't about the money. Walk day is celebrating our little warrior who fights this disease on a daily basis with no end in sight. It's after the walk that our focus turns from celebration to motivation and progress. We believe in JDRF. 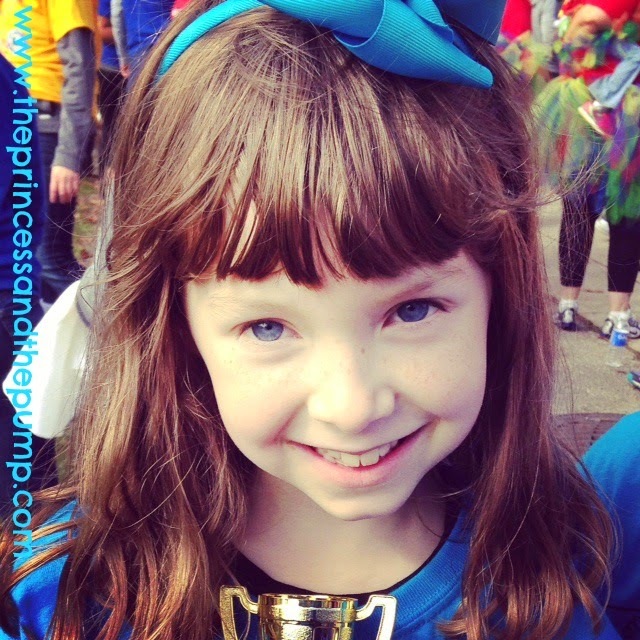 We believe that the research JDRF is funding is going to change the future for Sweets and her life with diabetes. And not just one day. It's changing her life NOW. The technology that is rapidly coming on to the market is making living with diabetes safer. I used to worry about how Sweets would ever be a normal kid and go away to college. Now... I'm so excited by things like the bionic pancreas and encapsulation that I know I have NO IDEA what life with diabetes is going to be like in ten years. We thank you for making our girl feel so special. We thank you for celebrating all her. We thank you for honoring her and all she deals with. We thank you for giving her the chance to live a long, healthy life. 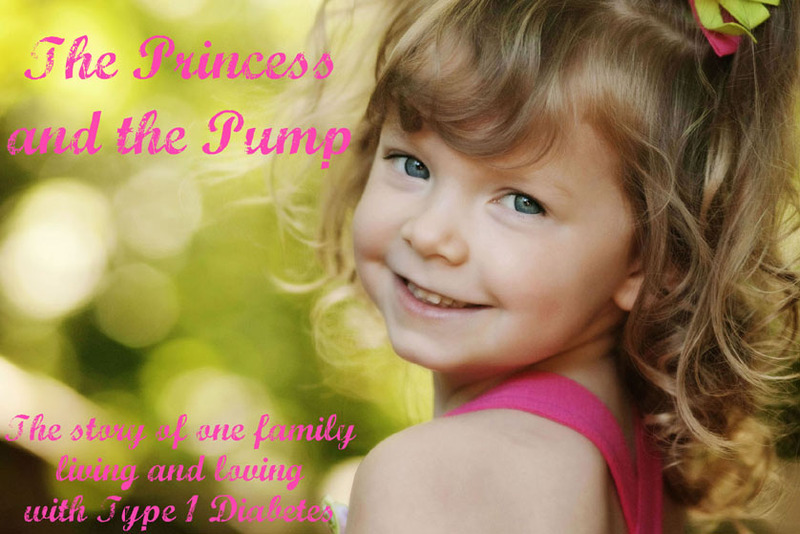 We thank you for having hope that one day she can live WITHOUT type one. 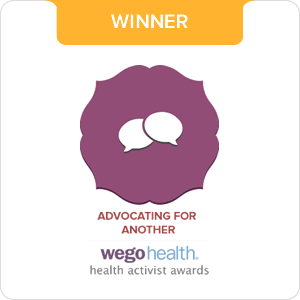 We thank you for helping not just Sweets but ALL people with diabetes. These words seem so inadequate. Just know that from the bottom of our hearts, we are grateful for your generosity. You may feel like it's just a small amount or just a donation... but it's not. It's so much more than that. It's a brighter future for this girl we love so much.